I made my first card with my Swirly Bird stamp set from SU today and I am in love with this set, but I guess everyone is since it is currently the best selling stamp set that Stampin' Up has. There will be lots more posts using this set. I didn't have much time to play with the set in a big way but saw something similar on Pinterest and just had to try it for a friend's birthday. I made two cards because I didn't know what color combinations I wanted so I made several and it was just enough for two cards. Colors for the pinwheels in the first card are Flirty Flamingo, Marina Mist, and Pear Pizzaz. 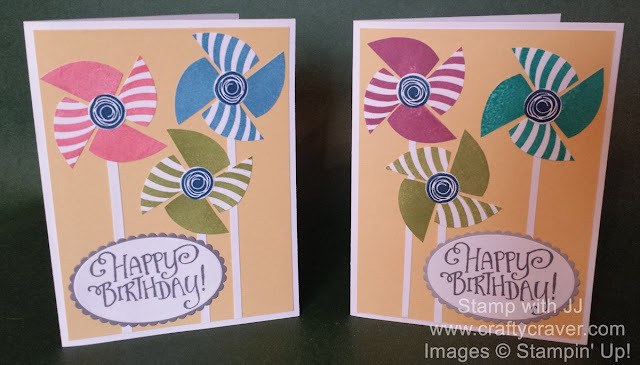 The second card has Sweet Sugarplum, Bermuda Bay, and Pear Pizzaz for the pinwheel colors. Both are using Whisper White and So Saffron (I think) for the base.